Ken was actually raised on polka music. Although he now plays a variety of tunes from every era,Anything from 1940-to the present.Keeping up with the changing of time’s in the music industry. In 1980 Ken’s Dad was diagnosed with lung cancer and passed away on Dec 24, 1982. 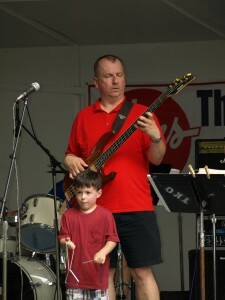 Ken was given the responsibility to head the Lenny Adams and the Polka Stars Band to continue maintaining the family tradition. In doing so, Ken tackled the task for a few years, but decided to put the great memories and sounds of the band to rest in memory of his dad. Where his brother Lenny decided to head the band Lenny Adams Trio. 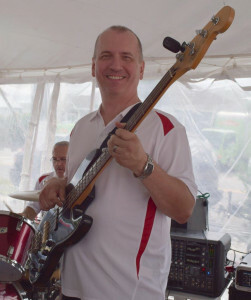 Ken then decided to start fresh with his own band, which was called The Class Act Band. Class Act continued on for about 5 years, eventually evolving into the current band TKO BAND. 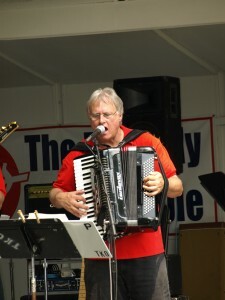 Over the past few years, the band has featured some of the most prominent musicians in the East Coast Polka scene, eventually leading the members to perform on the CD’s published by TKO; in 1994 “TKO Round 1” and in 1999 “Another Round”… Along with some of Pennsylvania Polka ch 44 Video’s. Ken has been the driving force behind TKO’s longevity, coming up on their 24th year-2018 Ken has been promoting the band to promoter’s/musicians/DJ’s and fans alike. He continues to keep the beat behind the music, and provides all the legwork for their success. He leads the band, providing all the technical and administrative support to keep TKO working. Although musicians have come and gone, Ken has kept TKO performing. Whether performing with a 3pc or 6pc group Ken will give 100% to provide great musicians for a great performance to dedicated fans. Ken is a current member in the following: Past Jr Gov. Moose Lodge, PGK Knights Of Columbus, Law Officers Association, Polish Home Club, Past President District 6 Civic Political Association, Treasurer White Marsh Police Precinct 9,Board of Director KofC and serving on The Financial Board at St. Clements Mary Hofbauer Church. Lucia began singing by the time she could sit up on the piano bench. Coming from a musical family, including mom Francesca, who sang live radio in the 40s at the Hippodrome Theatre to 3 older sisters playing piano, singing, dancing and staring in their own written plays, music was a very big part of her life. She sang in many choirs throughout her school days and in college, and then joined various Church and other singing groups. She is a soloist for weddings, funerals, and she even sang in the choir for Pope John Paul, II’s visit to Baltimore. In the ’80s and early ’90s she sang in a local rock band called “Off Limits” along with some friends, who urged her to join. Once the band dissolved in 1996, she began a Karaoke partnership with another fellow singer/friend and is still co-hosting Karaoke gigs while performing with TKO. She had no plans to join another band but within one “sit-in” on a TKO practice night, she was hooked again! “There’s nothing like the feeling of singing with a live band, especially such great musicians like the guys in TKO”! “Thanks to Ken for inviting me to be a part of the band and hope I can stay for as long as my voice lasts”! Eddie Biegaj acc/vocals by request!!! !